We believe everyone should afford to learn math. That is why we do not charge extra "registration" fees or limit the number of students to one. We also offer Scholarships based on merit via our partners at Math Matters! Contact us to learn more about scholarships. Jeremiah started in our system with understanding two digit numbers. In just the spring quarter, he was able to progress to early multiplication and division. Ethan Learned 4 years Of Math! Ethan started counting with us, and within several months made it to fractions! He used the system just 45 minutes per week! We are so proud of Cecilia! She started in our system at kindergarten level math and is now multiplying, dividing, and working with fractions. William is just a 3 year old that is entering first grade math. In less than 3 months, we took him from counting to addition and subtraction. Now that William will understand the teacher and curriculum coming into school, he will not have any issues keeping up in class. Staying within our system, William will be introduced to concepts typically reserved for older children. The sooner he understands them, the sooner he can move on to more complex topics such as writing code or understanding physics. Kennedy is still excelling with the app. The new format is easier for her to decide what she wants to do and she does play it while we are in the car or while I myself am doing homework. She will hopefully continue with her love of math because of this app. Thank you again for giving her the opportunity to enjoy the app after hearing of our story! Their customer service is truly exceptional. I have to say that the team at Elephant Learning is so helpful and so responsive! Their customer service is truly exceptional. My girls are really enjoying this program. We are doing it for the summer as a supplement to our homeschool math curriculum. 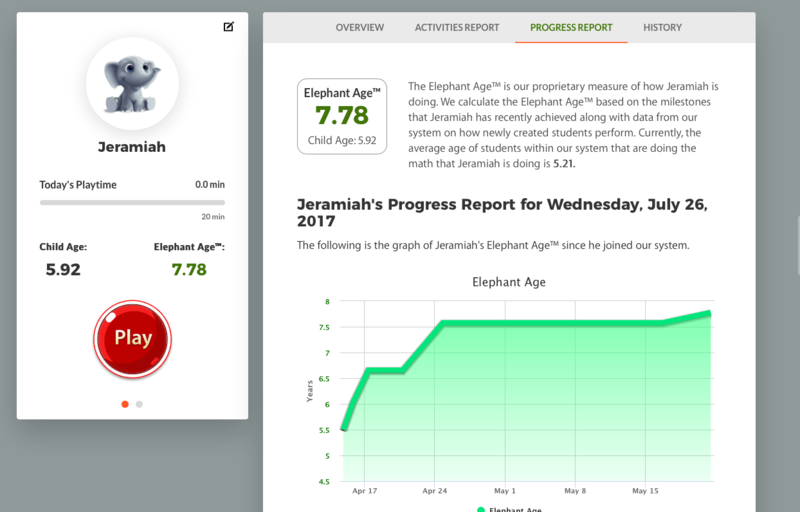 My daughter, who just completed 4th grade, will probably skim through her 5th grade math book and go into 6th grade math in the fall, thanks to Elephant Learning. Today, she just started pre-Algebra and she is so excited and loving it. I also really like the analytics and parental tools in the program. Very well done! Can I Sign Up My ENTIRE Class? I've just discovered Elephant Learning and tried it out at home. I'm a teacher at a school in the south Denver Metro area. We use inquiry based, personalized learning, and are always looking for apps that are concept based (so hard to find)! This is the BEST math app I've discovered! Is there any chance I can sign up my entire class? We started Elephant Learning 3 weeks ago. I don't like to review things like this too soon as I really wanted to see results for myself. We are math teachers so we were a little skeptical that our son would have such gains so quickly. However, we just got the email today informing us that our son has made almost 2 years of growth in these 3 weeks. We are following the 10 minutes per day, 3 days per week guideline that was provided by the developers of the app. We believe in following the program as recommended for maximum results and it is working! Just an example... he has struggled with math from Kinder through second grade. But, last week, while planning for a family trip, our son was sitting in the back of the car when we were talking about being gone for 3 days. This is kind of funny, but, from a mathematical perspective, a very big deal -- he told us that we needed 3 pairs of underwear and 3 outfits each. He then said, "that would be 9 pairs of underwear and 9 outfits altogether, guys!" WOW! I know that seems pretty basic to adults with a good understanding of math--but this is coming from a 7 year old who has struggled with these concepts! We did not ask for this information at all--he just came out with it himself! I think the developers of this program will really understand the impact of this! I am so pleased. My son has some difficulties with attention and the disguised-learning, game-based approach has really worked well for him. We're very pleased with the results thus far and will be continuing to use Elephant Learning indefinitely. I love that they offer scholarships to needy students and will also recommend this to parents during the upcoming school year. I highly recommend this program for all because it your child will truly understand HOW and WHY math works vs memorizing “stuff” they never really understood. A must have for all children. Elephant Learning is a phenomenal learning tool. My daughter loves the fact that they address her by name. Also I love the fact that it's not like traditional math apps. What is 6+7? Instead, they ask the child to give them 6 of whatever item they choose then they ask for 7 more. The child then is counting and adding without realizing it. Essentially your child puts math into practice. Based on your child's areas of need a worksheet is available for parents to print out to work on areas of concern. A report is generated with areas where your child understands the concepts and where their understanding is lacking. It does a great job helping your child learn math concepts! So much to say. My daughter doesn't mind the sound of the computer voice. In another post, the parent mentioned that regardless of whether your child chooses to count with pandas, space ships, hamburgers or strawberries they are going to work on the same concepts. That is true, my daughter doesn't seem to mind. The app is tailored to help your child progress in THEIR areas of need. So that's why regardless of their item of choice they are going to work on the same concepts.Thanks so much for creating this app. My daughter is 7 when she started maybe 4 months ago her understanding of math concepts was that of a 5 year old. Now her understanding of math concepts is that of a 1st grader/rising 2nd grader. She is so confident and competent. ?Brings tears of joy to my eyes literally. The greatest thing I notice is that my students’ understanding of number sense has greatly increased. Students that I knew could hardly identify numbers 1- 5 last year are now adding and subtracting. I have three children, ages 3,4, and 7. I joined because my 7 year old has always struggled in math. However, after just about a month of using elephant learning, she is making all A's in math. What Used To Be A Struggle Is Now Enjoyable. My homeschooled children are 7 and 4 and absolutely love Elephant Learning!! What used to be a struggle is now enjoyable and they actually ask to do math!! Its pretty awesome when your child 12 /grandchild 5 begs to play her math 'game's love this!!!! Thank you to the creators! We have been homeschooling for 4 years and for the first time ever my kids are begging to do math! This program truly allows children to learn at their own pace! I've been forced to set a timer to limit their time on the site. Who ever would have thought that would be a problem with math?!? I certainly didn't. The program gives parents guidance for offline learning and gives parents a look at their children's progress and learning level. They communicate with you by email to see how your kids are getting along and offer assistance. And the price tag is so affordable! They even have price reductions for families if they have the need. I was a little unsure when I first saw the advertisements. Even after logging on I had found a simple website and wasn't sure how such a plain and simple site could promise so much. But sure enough after only a week my 3 year old is doing math at the same level and 5 year olds! His siblings have seen a great deal of progress as well. His older brother is 5 and working at the same level as 6 year olds. His sister has just continued going farther and farther so she hasn't finished the assessment stage of the program yet. We are excited to see where she is at. I plan to update this review in 3m time. A few months ago, I saw an Facebook Ad about Elephant Learning. My daughter has always been interested in numbers and counting. She is currently 3 years old and I thought what harm is there is trying this. With only 10 to 15 minutes and 2 or 3 days a week she has jumped from age 3 math to age 5 math! This is seriously in under 3 months. Even outside of numbers, her ability to use logic and come to conclusions has improved as well. While my daughter has generally been quick to learn I wasn't expecting such a dramatic difference. Our daughter loves Elephant Learning...she literally gets excited to do homework. Not my child. 🙂 This has been incredible for her learning math and has allowed her to blow way past her age level. My Kids Love Elephant Learning...They Ask to do Math every Day. This system is so personalized to each child. As a Mother, I greatly appreciate receiving routine updates on my children's progression. We Love Elephant Learning! Last school year was a train wreck for our daughter. Last school year was a train wreck for our daughter. She is autistic and had been in a contained classroom for special needs students, being retained a year already. Although she functions anywhere between 2nd and 4th grade, she was getting ready to enter middle school 2017-2018. We made the decision to home school this year, recognizing she would fall between the cracks and continue to get further behind if left in public school. She has tremendous issues retaining information and we knew repetition was our best friend... so after much research, we chose Elephant Learning as a supplemental resource. The weekly time commitment is minimal and she works independently which means I'm not having to be the bad guy. She quickly 'got' the format and I've been able to easily track her progress and any areas of concern. I've found that by having her focus on every other weekday using Elephant Learning, I can address her weaknesses on the days she's not doing the program. 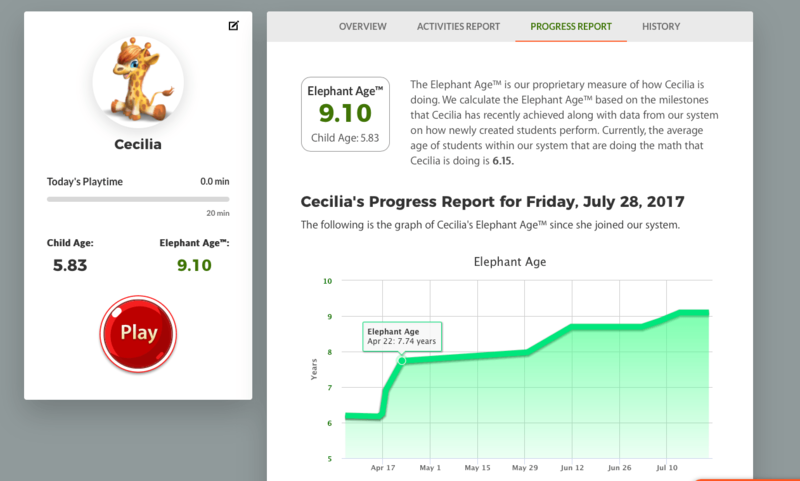 We've been using Elephant Learning for less than 3 months and she has jumped 2 years in her math scores! We will definitely continue supporting her curriculum using Elephant Learning. FYI... their support team is to be applauded as well.. the few times I've needed help, I've received assistance within an hour of my contracting them. Feel free to message me personally if you need further help. Jamie. My kids (8, 10 and 11) have been enjoying this program. I like how the voice changes so they don't tune them out. They use the kids' names and also read aloud the question. There is NO TIMER so they can think the question through and really focus on accuracy and not speed. We've enjoyed it immensely and seen a lot of growth in the 8 year old especially. Elephant Learning seems to be a more concise and efficient way of achieving the understanding that Common Core strives for, and often falls short of. 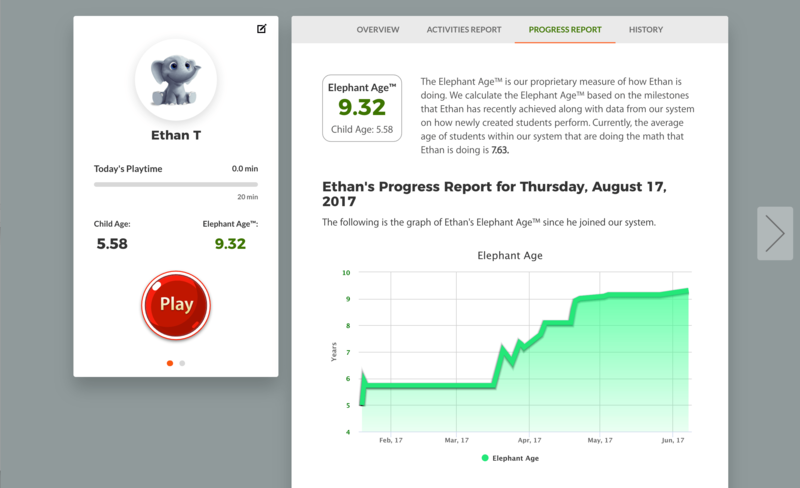 Elephant Learning has been a great tool for my five-year-old daughter to learn math without an enormous time commitment to the screen. My daughter does it about twice a week, for about 20 minutes each time. She enjoys the games, and has shown good progress in her understanding of basic mathematical concepts that are all seamlessly tied together. Elephant Learning seems to be a more concise and efficient way of achieving the understanding that Common Core strives for, and often falls short of. Do I have complaints? Sure. The app can be graphically heavy and slow, though this has gotten better with each update. The robotic voice can be annoying, though this has also improved with each update. There are a variety of games, though they're all essentially the same thing. The content and logic of the app have retained the same high quality since we've been using it, and my daughter has enjoyed it while being challenged. I and my daughter love this program my daughters three. Her math skills are beyond her age level and [she] continues to progress ... Not only that, the staff is so helpful and caring, continuously reaching out. Love it. We are so pleased with Elephant Learning! My kids are 10, 7, and 3, are all are learning and having fun with this program. The best thing is my 3-year-old wants to play, and actively comes to me asking for the app. Not only is the program fun, but extremely engaging for all 3 kids. I highly recommend this program. She Begs To Do It When I Forget! My daughter is three years old and I learned about Elephant Learning by searching for math apps that went beyond just recognizing numerals and counting small sets. We do 5-10 minutes of "Elephant Math" most nights and she begs to do it when I forget. Her current "elephant age" is 5.5 years and I love that she's learning math at her own speed in a fun way! My kids all love this math program, especially my six year old son who is now at a level 2 years above his grade level, after only a few months of use. It is such an amazing program and I'm so happy to have found something he enjoys while at the same time is helping him learn! Thank You For Creating Such An Amazing Program! I just wanted to stop by and thank you for creating such an amazing program . Our son Eragon who has severe dyslexia is doing so great using Elephant Learning. We are so glad that we decided to try this very effective program because we are seeing such amazing progress and excitement and it makes our hearts very happy. Hopefully, you have plans to expand the program and help children as they grow past 12 years old because your methods are the solution to filling the math learning gaps that children face. Keep up the good work . Just started this program with my three kids. All three kids have made progress, but my youngest jumped up a full year in about a week! I am really impressed with this program. Within Two Months My Daughter Caught Up By Learning 2 Years of Math! My stepdaughter failed 5th grade math, she was almost 2 full years behind where she should be. Within 2 months, we caught her up to learning what she SHOULD have been learning this year! My son is a math addict, and he's now 2 full years ahead of where he should be and he's excelling. The benchmarks and knowing how many questions they get right and wrong have been SO helpful. Even their teachers are impressed. What a Great Math Tool! We LOVE Elephant Learning! We started at the beginning of August. My son is 4.8 years old. His Elephant Age started at 5.0. He is already up to an EA of 6.64 years. My daughter is 10 but started at an Elephant Age of 9.5 years. She is already up to an EA of 10.0. What a great math tool! So far my children have been learning a lot through this app. What really caught my eye was the scholarships to be able to provide low income family the ability to purchase a learning tool for their children and even better, can do more than one child per account. I have to force my children to do the app because they rather play other games than this but once they get on, they don't complain much lol. Seeing their learning curves and what they are struggling with gives me a piece of mind and that if they are doing great at it, they can test out of that area. Which is good cuz it'll get more challenging for them. Learned about this through DU. There are a ton of so-called "leaning" apps that are out there, but this one is backed by years of research and developed at a University, so I was intrigued and wanted to learn more. To date, our 4 year old loves Elephant Learning and asks to "play games" all the time. His screen time is very limited, so I love having an educational option for him during the few times he does screen time. I like the status reports that are emailed to us on his math proficiency growth as well. He is doing the same math that children typically do at age 5.7 years. My son doesn't even realize he is doing Math - to him it's just a game. We've been very pleased with the program. Elephant learning has been a great addition to our home school curriculum. In less than three months my 9 year son old reached 11yr for his elephant age. My six year old daughter reached more than 8yrs old in elephant age and it become such a goal of theirs to do better they began to compete. I was ecstatic! My four year old is now begging to get in on it and with only a few times on she is nearing 5 years old in her elephant age and she turned four in February!! This is just beginning for my 3 yr granddaughter that has autism. She has consistently scored at a higher age level on math during evaluations, but this program is truly showing what she knows and is learning. It is amazing to hear her giggle while learning. She aged from 3 to 4.9 yrs in the 1 day of using the program. Delighted to be using this program, and am sharing with everyone. Thank you for the scholarship! I’ve fought with my daughter so much over math. It would become tears & emotions cause she just couldn’t get it. She has been in the program a week & shes excited! She’s getting it. And when she doesn’t she’s not in tears anymore she goes “ ok I’ll get it”. And the worksheets she’s actually understanding! This is worth it! Elephant Learning is a great app. My daughter did not like to do math. She would give me a hard time and would cry most of the time. Since we started this program she now has a fantastic attitude. She is more confident to the point she will say mom I got this. ?? I am truly grateful to Dr. Aditya Nagrath and the staff. When ever I need help or have questions, everyone is quick to respond. I have recommended this app to all my friends and family. When he started, he was at age level 4 and he is now beyond age 6 in a short time. We have been very impressed with the Elephant Learning Program! I first began to see advertisements for the program on Facebook and knew no one else in my circle of friends and family who had tried it. Our son is in preschool and was just beginning to show an interest in math. We wanted to gauge his skill level and create a positive learning experience for him, since we know that children form opinions about science and math at an early age. He'd recently received a tablet for Christmas and so we added Elephant Math to his list of apps. I am very selective about what apps and games he is exposed to and when he saw a new app, he went for it. I could tell by his enthusiasm that he was enjoying the games and the time flew by - I'd let him play for 20-30 minutes sometimes. Our son quickly advanced through the pre-k skills as the weeks passed. When he started, he was at age level 4 and he is now beyond age 6 in a short time. This application continues to be a favorite for him and we will continue to subscribe and encourage him to play. The evaluation that we've received is very detailed and has been very encouraging. At first I was skeptical of my daughter learning a whole year worth of math in three months. After three months of using elephant learning, my daughter's math skills have soared beyond what I expected. She requests to do her math frequently and I love that the sites has suggestions on how to further their learning away from the computer. I love that my daughter loves math now ands it's not a struggle to get her to learn with this program. We can't tell you enough how much we love the program. You get a lot for the money with the always progressing overview of your child's progress, suggested activities that clearly outline how to work further with your child - (invaluable! ), the progress reports that are also sent directly to your email, and history to see your child's achievements clearly. My daughter stays on it far beyond the normal times and it is amazing what she figures out on her own. I would have never thought to give her fractions yet and she is getting the basic concepts at 4yrs 2 months old. She just can't get enough of it and as parents we find ourselves with dropped jaws watching that moment when she figures out on her own how to count by threes or how to fill out 1/3 of what is shown and without us helping her! Thank you so much Dr. Aditya Nagrath PhD and team for putting together such a great program. As a parent, I am just in awe of the insights you have given my child. My two daughters (9 & 4) have really enjoyed playing the games and seeing their “age” increase! It allows kids to “play” and not realize they are working and increasing math knowledge and understanding! Wonderful program! We learned about Elephant Math from Hellene Hiner who we use for Piano lessons via Soft Mozart (another incredible program). I love the simplicity of the program and have been amazed by the progress nub daughter has made in such a short period of time. We love it! My son (4 y.o.) has had a great time with this program it not supper time intensive but he has made great strides. In prek he is already able to do subtraction and addition worksheet all on his own after only 4 months. My 4 year old grandson recently came into the program knowing how to count to 100 and able to add and subtract to 20. In one week he has advanced to an elephant age of approximately 8 years old. He wakes up every morning asking to play "elephant games" and is thrilled as he progresses 3 - 4 levels in about 20 minutes. I am thrilled that these professors created a program to help children excel in mathematics. Absolutely excellent! My daughter Hannah (just finished Kindergarten) just turned 7 and her math age with the assessment showed her at 6.3 years to start at beginning of June (didn’t do from June 22nd until August 1st due to vacation) and today August 1st she is at 7.89 math age. So in a total of about 3 weeks time she has gone up 1.5 grade levels! This program is amazing! Maybe I can get her into Talented and gifted program based on her math skills! 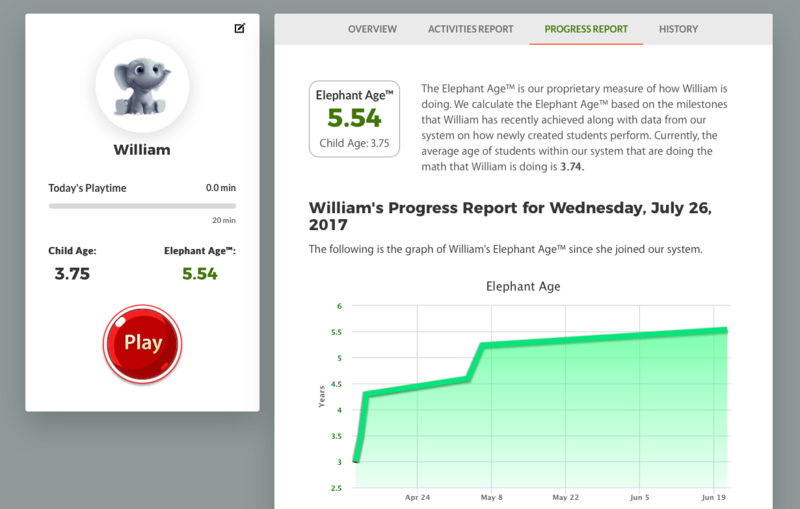 Elephant Learning really helped my daughter when she was struggling with math at the beginning of the school year. She loved the games and she said it felt like games.. not learning math. My daughter LOVES it, I have to tell her to get OFF her lessons, has helped her SO MUCH!! THANK YOU!! VERY HIGHLY RECOMMENDED !! My daughter has ADD and struggled in math in every grade she now going into 7th grade we started Elephant Learning but it was at the end of the school year so she didn't work on it much we just started a week and half ago she went from 7.5 elephant age to a 9.3 elephant age ! Our goal by the end of the summer as her to be 12 Elephant age by the end of the summer. DOING Elephant Learning has made her more excited and confidence about math. She has almost caught up, just within a few short months! Both of my daughters have been using Elephant Learning. Not only do they enjoy it but they are growing tremendously. My 8 year old was about 2 years behind in her math and now she is almost caught up just within a few short months!! My 4 year old loves math and is now doing math that 6.7 year olds are doing! I’m so happy with this program and how it’s helping my kids in different ways!! My son math skills have steadily improved. My son math skills have steadily improved. He enjoys the math games. Awesome, tool for reinforcing and building better math skils. His Elephant Age Gets Higher Every Week! My son Maverick (3.5 years old), loves this! He asks to play it everyday. It’s very simple for him to follow, and I can see his progress each time he plays. His math age is 5.3, and it gets higher every week. I am so happy we came across this program.